Just about everyone who uses a computer has experienced discomfort in the neck, upper back, arms, wrists and low back at some point. 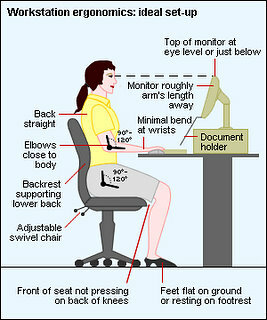 Click here for "Checklist to Determine Whether Your Workstation is Ergonomically Safe"
Click here for article "Smart Choices for Back and Neck Health"
Click here for article "Consumers' Guide to Sit-Stand Desks and Risers"
Click here for article: "10 Tips For Reducing Computer-Related Eye Strain". In addition to following these ergonomic tips, take 30-45 second 'micro-breaks' every hour to stand-up, shake out your arms and allow your eyes to focus on something farther away than the computer screen. You might even try taking a short 5-10 minute walk in the middle of your day to encourage some leg circulation and stretching your muscles. We Care! Our chiropractic office is committed to keeping your spine- and overall health on the straight and narrow. 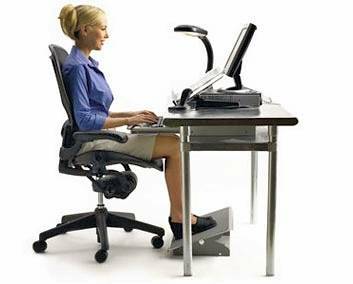 If you have any concerns about how the ergonomics of your workplace may be affecting your health, plan on discussing it with Dr. Pisarek either at your next visit, or click here to send him an email.